Phillips 66′s most profitable refineries of the past couple years are in what’s called the Mid-Continent — from Texas north to Montana including the Borger refinery, Ponca City, Wood River and Billings. The reason for their high profitability has been the glut of crude oil pouring into the region from newly tapped shale oil plays like North Dakota’s Bakken. "Because there was a lot of new oil and not enough pipeline capacity to get it down to the Gulf Coast mega-refineries, the crude got bottled up in the storage tanks at Cushing," writes Helman. "The bottleneck that kept oil from getting out of Cushing also kept its price at a record-wide discount relative to its rival European benchmark Brent crude. At one point last year you could buy a barrel of WTI for $27 less than a barrel of Brent. Historically WTI has been slightly more expensive." Photo: National Energy Board of Canada Click graphic to enlarge. Garland said during his analyst call on April 9, 2012 that the refining and marketing segment has one of the broadest geographic bases of our peers. Phillips 66 has 15 refineries and 2.2 million barrels a day of capacity and is the sixth largest non-governmental controlled refiner in the world, the second largest US refiner. Phillips 66 is the only independent downstream to have significant ownership and interest in gas gathering and processing in the global petrochemicals business. Greg Garland told investors and securities analysts at the 2012 Barclays CEO Energy-Power Conference in New York on September 5, 2012 that Phillips has the broadest geographic segment within our peer group. "We think this geographic footprint gives us a very competitive advantage. It's a great platform for capturing advantaged feedstock and optimizing the product placement that comes out of the refineries. You can see 15 refineries, 11 in the US. We have substantial infrastructure that supports the refineries in terms of 15,000 miles of pipe, 50 some odd terminals, barges, railcars, etc." Greg Garland told security analysts at the Credit Suisse Global Energy Summit on February 12, 2014 that the Refining Business Segment is always is going to be a very volatile business for Phillips. "We don't see that changing in the future. I think small changes in operating rates in infrastructure are going to create dislocations. I think having a large system like we have, having a very sophisticated and large commercial organization like we have, we're going to be able to take advantage of those opportunities that come our way." In answer to a question from Blake Fernandez of Howard Weil Incorporated, Greg Garland told analysts at the 4th quarter earnings conference on January 30, 2013 that he expects a 15% ROCE in the R&M Business Segment going forward. "My view is that, refining historically has been kind of a 10% to 12% business," said Garland. 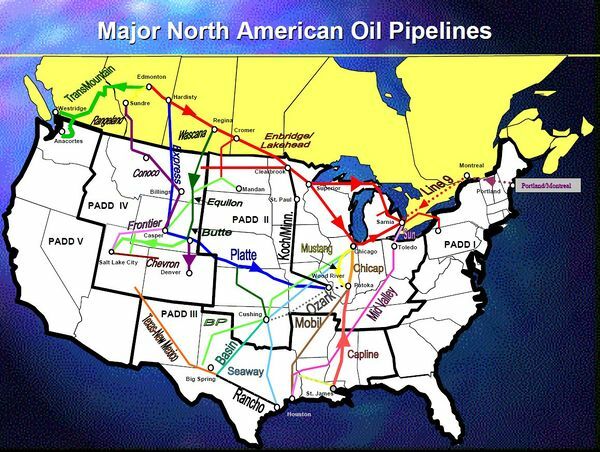 "We think we have plans in place to advantage crude capture, yields, cost reduction, that we can move it 400 basis points. So it’s a 15% business going forward for us versus a 30% return business in Chemicals. And probably Midstream business 15% to 17% returns is kind of what we’re looking in fact. So, to the extent that we have 30% and 40% return projects in refining, we’re going to do those. I think, I mean we do get challenged by people all the time or we under investing in refining. At this point, we don’t think so. I don’t think there’s any opportunities out there, we feel that we’ve missed in terms of an investment opportunity in the refining space. Our focus is going to be very disciplined. We’re going to restrict capital in this space. We’re going to improve returns in this space. And so we don’t see a change required in our strategy at this point in time." 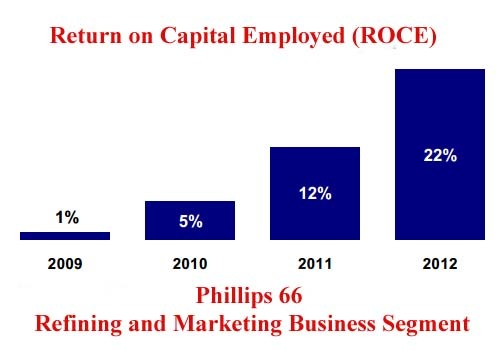 Greg Garland told analysts at the 4th quarter earnings conference on January 30, 2013 that Phillips return on capital employed for the R&M segment, which includes over $3 billion in goodwill improved to 22% for 2012, up from a 12% return for 2011. "The earnings of all four of our refining regions increased primarily due to improved refining margins," said Garland. "The improvements in refining margins, reflects not only higher market crack spreads, but also an improved feedstock advantage especially in the Gulf Coast, in the Central Corridor regions. The improvements in feedstock advantage increased earnings in the Gulf Coast by over $200 million and by over $100 million in the Central Corridor. Finally, other refining was up this quarter compared to last year, primarily due to movements of Canadian crude supply to several of our refineries." Reuters reported on August 2, 2012 that Phillips 66 posted an annualized 17 percent adjusted profit for the R&M Business Segment for the 2nd quarter of 2012. 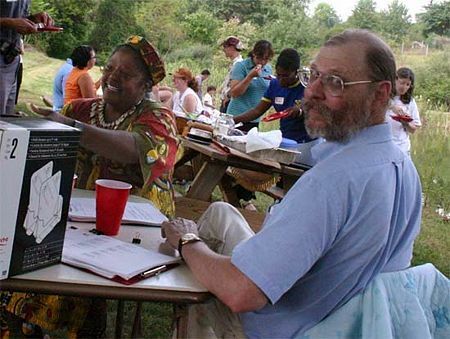 "The adjusted net profit for 2011 was 12%. Refining and Marketing generated $1.2 billion in adjusted earnings," said Phillips Chief Financial Officer Greg Maxwell. "The $437 million improvement was primarily driven by much stronger refining margins particularly in the US Midcontinent and Europe." NASDAQ reported on May 24, 2012 that Clayton Reasor, Phillips 66's senior vice president of strategy and corporate affairs, said that Phillips 66 expects global refining margins to drop in 2012 and 2013 and that US gasoline demand growth in the U.S. and Europe is expected to continue to fall, while demand for distillate fuels, such as heating oil and diesel, is expected to jump, driven by growth in developing countries. "What we need to do as a refining company is ship out our yield away from gasoline to distillate to the extent we can," said Reasor. "As gasoline demand continues to fall in the U.S. we need to find markets for our products." Part of Phillips 66's strategy to become more profitable is boosting its fuels exports to more than 200,000 barrels per day by the middle of the decade, up from 100,000 barrels a day last year. ConocoPhillips announced on April 23, 2012 that for Q1 2012, R&M’s worldwide crude oil capacity utilization rate was 91 percent, reflecting minimal unplanned downtime. The U.S. refining capacity utilization rate was 89 percent and the international rate was 97 percent. In addition, the worldwide clean product yield remained at 84 percent. R&M earnings were $452 million, compared with $482 million a year ago. The slight decrease was primarily due to lower refining margins, partially offset by higher marketing margins. Refining margins decreased as the impact of less favorable crude differentials more than offset improved market crack spreads. Pre-tax turnaround expenses for the quarter were $176 million, in line with expectations. ↑ Phillips 66. "Transcript of Q2 2012 Phillips 66 Earnings Conference Call" August 1,2012. This page was last modified on 19 April 2014, at 15:19.